Plants and the Life of Moses includes entries about Moses and the bulrush cradle, the burning bush, the 10th plague (bitter herbs), the bitter waters at Marah and the mangrove, manna and the coriander seed, and Israelites’ desire for vegetables (the onion). Onycha is the most controversial ingredient used in incense when it was prepared for use in the tabernacle on the Sinai Peninsula. Originally, Bible scholars believed that onycha came from a shell fish that was common to the Red Sea area. The problem with this hypothesis was that Mosaic Law identified that all non-finned and non-scaled fish were unclean and should be considered detestable (Leviticus 11.10-11). The Talmud stated that onycha (shecheleth) grew from a plant, most likely an exudate from a bush or small tree. According to Winifred Walker’s All the Plants of the Bible (1979), shecheleth is a form of rock rose (Cistus ladaniferus var. creticus), which produces a resin called labdanum. The flowers of the rockrose bush are described as having petals with scarlet and black fingernail-shaped markings. Usually, rock rose produces labdanum annually, during the summer, to protect itself from the heat. When aged labdanum becomes more fragrant. The fresh resin is a soft, sticky, and tar-like substance that is sweet, flowery, musky, and reminiscent of honey or ambergris with a hint of sweet leather. As labdanum ages it becomes hard and brittle. I planted Cistus in the church Bible garden. The plant lived two winters but did not make it through the third winter (Plant Zone 7). When I checked for more plants at my neighborhood nursery, the manager told me that they no longer sold Cistus because it did not overwinter in the Roanoke climate. Labdanum, the product of onycha, is produced to protect the flower from heat. My thought is that I can produce nothing to protect my body and mind from heat. Jesus give me protection from heat, from all stress, worry, tension, strain. Reflection: “Who can stand before his indignation? Who can endure the heat of his anger?” Thanks be to God that Christians will never have to endure God’s indigation and anger. We got Jesus!!! Story: After the Tabernacle was built and dedicated, the Israelites set out from the Mount Sinai area. Soon afterward, a group of individuals called “the rabble” began to complain about the hardships they encountered. Most scholars believe that the rabble were not Israelites; but opportunists who opted to leave Egypt when the Israelites slaves were allowed to leave. By this time, God was feeding the Israelites with manna. One complaint by the rabble was that they craved food other than manna. Hearing the rabble complain, the Israelites joined their complaints. Both groups wailed and said: If only we had meat to eat. We remember the fish we ate in Egypt at no cost – also the cucumbers, melons, leeks, onions and garlic. But now we have lost our appetite; we never have anything but manna (Numbers 11:4-6). In response, God did two things: 1) he gave the people quail to eat and 2) he killed all complainers. The Israelites buried them. The name of this place was Kibroth Hattaavah and it appears to be about 45 miles northeast of Mount Sinai. Garlic was one of the foods that poor individuals and slaves ate in Egypt. In the United States, we use garlic as a seasoning or garnish, i.e., in stews, roasts, salads and on top of bread. Possibly garlic was more of a food staple in Egypt. I can imagine after over a year of eating manna, the rabble and some Israelites were tired of the monotony eating a relatively bland diet of manna. Thus, their complaints. 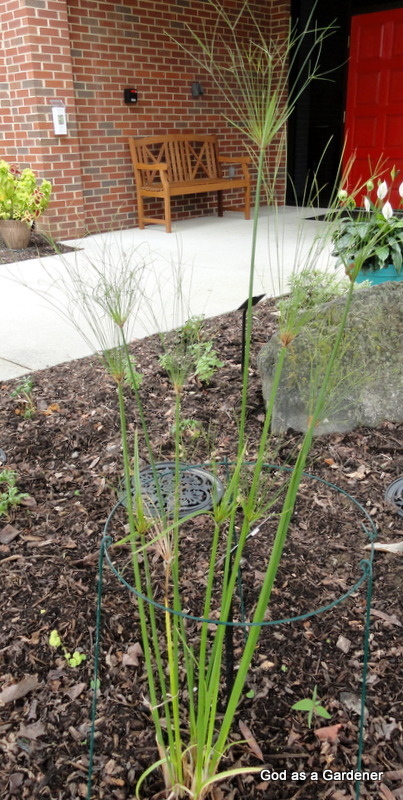 Growing Garlic: Garlic (‎Allium sativum) is easy to grow and produces numerous underground bulb. Plants are frost tolerant! Garlic can be planted early in the spring but bigger and more flavorful garlic comes from garlic planted in soil and allowed to overwinter there. Break apart cloves from bulb a few days before planting, but keep the papery husk on each individual clove. Plant cloves about one month before the ground freezes. Place cloves 4 inches apart and 2 inches deep, in their upright position (the wide root side facing down and pointed end facing up. Mulch heavily with straw. In the spring remove the mulch after the last frost. Larger garlic bulbs will result if you cut off flowers that emerge in the spring. Over the summer fertilize with nitrogen especially if you see leaves turning yellow. Water every 3-5 days but do not let garlic stand in water. Do not plant garlic cloves from the grocery store. They may be unsuited varieties for your area, and most are treated to make their shelf life longer. Obtain garlic cloves from a mail order seed company or a local nursery. Symbolism and Application: Beyond its intense flavor and culinary uses, this “stinking rose” is an insect repellent and has been used for centuries as a home remedy. I believe that the symbolism of garlic is stink. The rabble in the desert stunk and their stink contaminated others, i.e., Israelites. Garlic acted as a bad apple that contaminated the bushel of apples because of its disease. The rabble stunk up or contaminated some true Israelites. About 30 years ago I attended a certain church. By the time of this incident, I had been attending about 5 years. One night I received a telephone call from a relatively new church member. He began to tell me all the things that were wrong with the preacher. I listened and mentally I agreed with some things and some I disagreed with; however, I didn’t refute anything he said. At the end of his descriptions, he asked me to join a group who was trying to oust the preached. My answer was “No, thank you, I do not want to go this direction.” I always wondered why he joined the church if he disliked the pastor so much. There were plenty of other churches of that same denomination in the community. Reflection: Garlic stinks and when eaten often causes bad breath. Christians who consume garlic-type foods can have bad breath when they witness to others. Please visit my webpage (www.CarolynRothMinistry.com) and look at my blog on Bible plants to read more on plants in the Bible. References: Exodus Chapters 3 and 4. From the time he was weaned through approximately age 40, Moses lived in royal splendor as the son of Pharaoh’s daughter. In that time he received an excellent education that included content on history, culture, Egyptian religion, leadership, and military tactics and arms. Despite these benefits, Moses knew that he was not an Egyptian. He was an Israelite and his people were slaves in Egypt. As an adult, Moses went to where some Israelites were working at slave labor. Seeing an Egyptian overseer beating an Israelite, Moses killed the Egyptian and hid the body. The next day Moses went to the same location and saw two Israelites fighting. When he tried to break up the fight, one man asked Moses, “Are you thinking of killing me as you killed the Egyptian?” (Exodus 2:14). Hearing these words, Moses became afraid; he realized others knew he murdered the Egyptian. Shortly thereafter, Pharaoh learned of the murder and attempted to kill Moses. Precipitated by these events, Moses fled Egypt and traveled to Midian. Midian was located east of the Sinai Peninsula and outside Egyptian influence. In Midian Moses met Jethro, a Midian priest, whose name means “friend of God”. The Midianites were offspring of Abraham and his second wife Keturah (Genesis 25:1–4). In Midian Moses married Jethro’s daughter, Zipporah (Exodus 2:21). Moses became a shepherd for his father-in-law’s (not his own) sheep (Exodus 3:1). After about 40 years in Midian, Moses led the sheep to the west side of the Midian desert, arriving at Mount Horab in the Sinai Peninsula. There the angel of the Lord appeared in flames of fire within a bush. Moses noticed that although the bush was on fire, it was not consumed by the fire. Deciding to take a closer look at the strange phenomenon, Moses made his way toward the burning bush. When God saw Moses approaching the bush, he called to Moses from within the bush and told him to come no closer. God instructed Moses to take off his sandals because Moses was standing on holy ground. Then God introduced himself to Moses, naming himself the God of Abraham, Isaac and Jacob. At this introduction, Moses hid his face, afraid to look at God. Talking from the burning bush, God told Moses that the Israelites were suffering severely under the slave masters in Egypt. God shared that he planned to rescue them from the Egyptians and lead them to a land of milk and honey. To this point, Moses was probably nodding his head and agreeing with God’s plan. Then, God stunned Moses by saying, “So now, go. I am sending you to Pharaoh to bring my people the Israelites out of Egypt” (Exodus 3:10). Immediately, Moses started questioning his qualifications to be the leader God described. God’s response was to continue telling Moses to go back to Egypt. In Egypt, Moses was to notify the elders of Israel first and then Pharaoh that the Israelites were to be permitted to leave Egypt. God warned Moses that Pharaoh would oppose him; but, God himself would work wonders to compel Pharaoh to set the Israelites free. Moses tried several ways to evade being the highly visible leader that God demanded. One of Moses’ fears was that he was “slow of speech and tongue” (Exodus 4:10). God told Moses that his brother Aaron, a Levite who spoke well, would be Moses’ speaker. Convinced by God to be the Israelite leader, Moses returned to Jethro where he took his wife and two sons and started for Egypt. The Burning Bush (Rubus sanctus). The nature of the burning bush is a source of debate among botanists and Biblical scholars. Some believe that the burning bush was not a bush, but a figurative representation of a supernatural phenomenon. Others contend that God spoke through a natural bush. 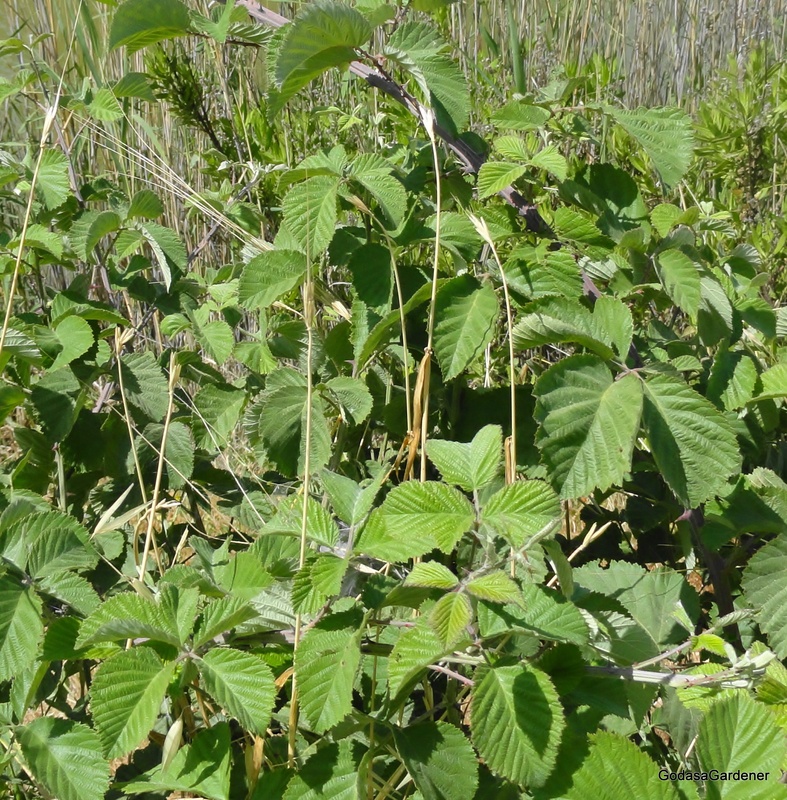 The opinion of Jewish scholars and botanists is that the burning bush was the blackberry bush, Rubus sanctus. Other names for the R. sanctus, are the Rubus sanguineus and the holy blackberry. Most likely the R. sanctus originated in the eastern Mediterranean region of Iran or Turkey. It is a perennial shrub that grows as a large thicket near water sources, e.g., in oases, on wadi banks, and in moist fields. The plant has no central stem; instead it produces long thin branches which can reach 5 – 6 feet in length. Branches have spiked thorns that bend downward. If a person reaches into the plant to pick the fruit, he will feel nothing; however, when he withdraws his hand, thorns will fasten into the flesh like sharp teeth. Jewish writers drew a parallel between blackberry thorns and the movement of the Israelites in and out of Egypt. When the Israelites entered Egypt, they did so with little notice. In contrast when they left Egypt, the entire country knew of them because of supernatural events and battles associated with their exodus. Generally the blackberry flower is pink. New blackberries are green. As they ripen, they turn red then black. 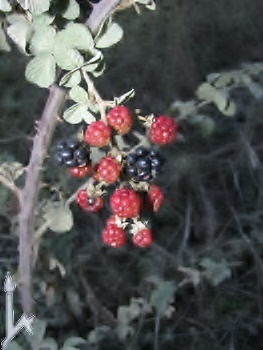 Fully ripe blackberries are plump, firm, and fully black. Never pick blackberries before they are ripe as they will not ripen off the shrub. Blackberries also propagate by vegetative regeneration; for example, re-growth occurs from the perennial root stalk, from the root stem tips, and from root fragments. • God revealed to Moses that he was the God of Moses’ ancestors: Abraham, Isaac and Jacob. God remembered Moses’ ancestors and the promises he made to Abraham, Isaac and Jacob from more than 400 years ago. • God revealed to Moses that he heard the cries and saw the agony of the Israelites’ slavery in Egypt. God was not limited to one land area such as Haran or Canaan where he appeared to Moses’ ancestors; rather God heard the cries of his people wherever they were. The Bible does not identify that the Israelite cries were in the form of prayers, but, God heard them. • God revealed to Moses that he was going to take action on behalf of the Israelites. God cared about his chosen people so much that he was willing to intervene in history to help them. • God revealed to Moses that he had a plan to see that his promises to Moses’ ancestors were realized. God is a God of specifics and details. Part of that plan was for Moses to act as the leader of the Israelites before Pharaoh. • God revealed to Moses that he knew the opposition that Moses would face from Pharaoh. God knows the hearts of men; he knew Pharaoh’s pride and stubbornness. • God revealed his power to Moses. God was able to take other forms, in this instance he was talking to Moses from a burning bush. God revealed his power by telling Moses that the “supposed” power of the gods of the greatest nation on earth, Egypt, would be no obstruction to God’s will and plan. Considering the attributes that God revealed about himself makes me glad that God is on my side. At the same time, I feel overwhelmed that God who is all powerful (omnipotent), all knowledge (omniscient), and always present (omnipresent) claimed me for his child. It is understandable that Moses hid his face in God’s presence – he doesn’t want God to see him and he was afraid to look on God. What am I going to do when God reveals himself totally to me? Reflection: How will you respond when you are face-to-face with God, when God is revealed fully to you?